That’s beet juice. Two summers ago, Matt planted beets in our garden, and we ended up with a record crop. He had the brilliant idea that we (me) should can beets, and we (yes he actually helped) did. It was a messy and smelly task. I ended up turning a couple nice kitchen towels into cleaning rags, and it took two days for the color to wear off of my hands. I can only imagine how Mike felt when he saw those pants; he had cleaned his fair share of restaurant aprons but had never seen anything like this. Mike expressed his concern to the customer, who just simply asked that we try. The pants were actually part of a suit, and he’d already inquired about purchasing a replacement pair but was told that wasn’t an option. I’d say it was the customer’s lucky day. After all, Mike just celebrated 40 years with A Cleaner World. If anyone could get it out, it would be Mike. Using a combination of a tannin stain remover and targeted steam, Mike spent the next several hours working on the pants. 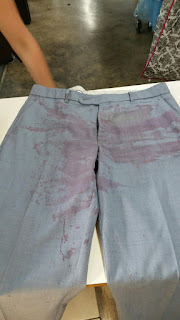 Once it appeared that all the beet juice was removed, he ran them through the dry cleaning machine. After they cycle was complete, he inspected the pants only to find there were a number of small spots remaining, so he just repeated the process a second time, and that took care of the remaining places. Mike couldn’t tell me how long it took him to get the spill completely out – but let’s just say he didn’t have any down time that afternoon. When the customer came to pick up the pants, he was simply amazed and incredibly grateful. Mike had saved him from having to purchase a new suit. And Mike was pretty pleased too. In his over 40 years of service with A Cleaner World, dealing with a beet juice stain was a new one even for him.